Peel and roughly chop the celeriac. In a medium saucepan, melt the butter, add the celeriac and stir until well coated. Cook, covered, over low heat for 10 minutes, stirring occasionally. Add the milk and bring to the boil, then turn the heat down and simmer for 15 minutes, or until the celeriac is very soft. Drain (discard all but 2 tbsp milk) and puree with the reserved milk until smooth. Season to taste. Preheat the oven to 180C. 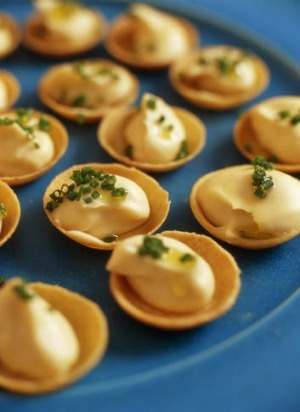 Spoon the puree into the tartlets, place on an oven tray and bake for 10 minutes, or until heated through. Drizzle with a little truffle oil and sprinkle with chives. Serve immediately.